Hey There! I'm Sailor Venus! 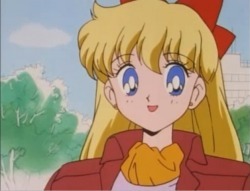 Hey everyone, my name's Mina Aino (Minako Aino in Japanese). Some things about me: I'm a bit of a ditz at times (I AM blond after all!) But I'm pretty grown up. I have a savvy cat named Artemis that has got me through some tough times. Some people may know me as Sailor V, but it's no biggie. Hey, you want to know something cool? A long time ago, I was destined to be the heroine Sailor Venus; a manipulator of the powers of the love, beauty and the crescent moon. And as for Artemis, he is kind of like my Sailor coach who found me and awoke me as Sailor Venus. I was actually the first Sailor Scout! Most people think it was Serena, but I was a scout a whole year before her when I was 13!